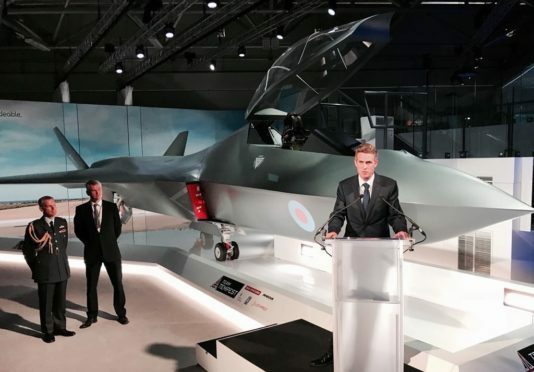 Defence Secretary Gavin Williamson revealed the new “Tempest” concept at Farnborough International Airshow in Hampshire – and said it could be capable of flying without a pilot on board. It is hoped that the jet will enter service in 2035 as an eventual replacement for Typhoon, which is due to remain in service until about 2040. RAF Lossiemouth was saved from closure in 2011 when it was announced that the Typhoon jets from Leuchars would replace the Tornado fleet in Moray. In 2014, it took over responsibility for the RAF’s Quick Reaction Alert force in the north, meaning it must always be ready to immediately respond to any threat to UK airspace, and £400million is currently being invested at the base to prepare it for the arrival of nine new Poseidon P-8 Maritime Patrol Aircraft. Last night, local MP Douglas Ross signalled that he hoped the new Tempest planes would also be based at Lossiemouth. “This is yet another significant investment by the UK Government in the defence capabilities of our country,” he said. “The Conservative led government is investing heavily at RAF Lossiemouth ahead of the arrival of the Poseidon P8 aircraft and the significant increase in personnel we will see stationed here in Moray. “The Tempest is a significant addition to the RAF and shows the willingness to invest in the next generation aircraft. A final investment decision on the new Tempest model, which is designed to maintain the UK’s status as a tier one military power after Brexit, is expected in 2025.